Build a Website with Site Build It! If anyone had told me 8 years ago that I was going to build a website I would have laughed. I do so wish that the IT Department at my last job could see me now. They were always my first port of call when I couldn't make something work on the computer at work, and believe me I called them often. Oh yes I used a computer at work to create documents, spread sheets, send e-mails and all the usual things you do in a commercial office. However the internet was something we were not encouraged to use except for research purposes and it was always a bit of a mystery to me. Websites were something that commercial businesses had not individuals like me. How times have changed in such a short time! Are you thinking of retirement but worried about the financial implications? Many baby boomers wishing to say goodbye to the day job are not able to afford to completely retire and are turning to the internet to make money by building an online business. Since going live with my website in March 2011 I have received many requests from people wanting to know if this is something they can do and how easy it would be. Many people are sceptical about online business promises and so they should be. There are a lot of unscrupulous people out there that want to sell you a system that's going to make you a millionnaire overnight. Don't believe them. If you want to build a website it takes time and a great deal of knowledge about things that ordinary mortals such as you and me don't know about and would probably be totally overwhelmed by. That's why if you are going to buy into something that provides you with the tools to build a website you also need a package that is going to take care of everything to enable you to build a business not just a website. It's not enough to simply build a few pages with a website development tool on it's own and hope that people find it. You have to receive traffic to a website in order to generate income and building traffic needs knowledge on how to use keywords to utilise Search Engine Optimization (SEO). If you're like me you will need a complete guide taking you step by step through the design and development process. It sounds expensive doesn't it? Well it needn't be. I used Site Build It and you can too. The Tools, Training, and Support You Need to Build An Income-Generating Website! The process is simplified to such a degree that success (i.e., profits, not the mere presence of a Web site) is achievable even for a beginner. For an experienced person, achieving success is even smoother. SBI! really does change lives. It's changed mine and it can change yours too. Then there's all the Articles in the Tips and Techniques section and the Forums where you can pick up lots of tips and help from people that have already done it and are prepared to help others to do the same. It really is impossible to list everything that's included. You need to see for yourself. SBI! is the only product that takes the time to prepare you to build a website and a profitable business, before you jump into building your site. For the beginner, your learning curve will be shorter and you'll bypass any show-stopping errors. For those experienced in site-building, SBI! deepens your level of understanding. No matter who you are, you are guided all the way until you succeed. To keep you on track there is continuous mentoring via the Action Guide and online help is always available either in the Forums or from the Site Sell Support Team. You can choose which method is best for you for learning either by reading a written guide or watching the video guide! Sometimes I used both. If you have two windows open on the computer one with the Action Guide and the other with Block Builder then you are carefully guided every step of the way, which make success that much more do-able. Advanced help is also available (when you are ready for it), all designed to save you time and keep you moving forward. Probably the hardest thing when you build a website is choosing your best site concept. It's not always as obvious as you might think but they have tools to help you there also. Brainstorm It! and Niche Choose It! show you the best path for your particular business, reveal some surprises, and help you make the right choice. When you're ready to think about the Look and Feel of your website there's an amazing choice of templates to choose from which you can customize yourself or pay the Site Sell Team to do it for you if you prefer. The choice is yours. If you're passionate and knowledgeable about a subject then writing your content should come easy but if you need help with that it's there. Once you have your content written you cut and paste it into Block Builder to create your pages. Page creation is as simple as riding a bike with its training wheels still attached. No need to know HTML. The block-by-block builder trains you how to write a page that is both "Search Engine and human effective." It's simple, do-able and most importantly, effective site-building. The block-by-block builder is perfect for beginners, but even many "advanced" users should start with this tool. It's an excellent way to break bad habits! It includes special blocks to upload graphics and html blocks to place your advert codes and affiliate links in. When you build a website you have to think about how your visitors and you are going to communicate. SBI! includes an easy-to-use form builder with autoresponders. You can build contact forms, surveys, and polls to easily communicate with your visitors. You don't need to use your e-mail address, which attracts spam. Experienced users will appreciate no longer needing separate form-building tools. Having these tools all in one place saves time and expense, too. The SBI! private forums provide friendly, helpful support from other SBI users who have had a passion to build a website and generate a passive income. Help is available from folks who are in the same place as you. This peer-to-peer support gets you over the humps along the way in a stress-free environment. Help is available even for advanced questions. The forums are a business-building support community ready to help you succeed. I've used them often and learnt so much more from other more experienced SBiers. To build a website with Site Build costs USD$299 a year. That includes everything from hosting, to buying your domain name and all the analytical tools that you are ever likely to need to not only brainstorm to give you ideas on what your website should be about but also supplying the best list of keywords that will generate traffic and ultimately provide you with an income generating business. You can even choose a monthly option of $29.99 a month if you prefer to spread the cost. Whichever way you choose to pay SBI! has a no-risk, 30-day money back guarantee. It's a risk-free decision that you can make with confidence and peace of mind. I decided I couldn't lose I paid my money and once I had access to all the tools and information I knew that it was something I could do. 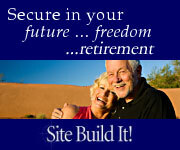 Site Build It is not a "get rich quick fix". It's impossible to say how much money you can make as each site is different. You have to be realistic and be prepared to do a fair bit of work up front to build a website. Approximately 30 pages of content and a minimum of 50 visitors per day before you are recommended to place adverts on your site and see any regular income. If you follow the SBI Action Guide you really can't fail to build a website that will ultimately generate an income. Obviously if you have a product to sell then the earning potential is easier to assess. With an information site like mine then monetization is from advertising links where you get paid on the number of clicks per link and Affiliate products that you can sell where you receive a small commission for every sale. You can also create e-books for sale utilising the content of your website in a different way which your visitors can download. There are lots of other ideas that you will pick up on. Some SBiers are earning more than their full time jobs paid them and many SBiers have created more than one site to increase their earning potential. I've only recently started generating an income and it's very exciting watching it slowly climb together with my continued increase in traffic. I have seen in the Forums that people have started generating an income after only 6 months. I decided to take my time and concentrate on quality of content first and foremost. If you're want to build a website and create an online business I can personally recommend it but you need to see for yourself. Take a look to look to see if it makes sense for you. Start with the Site Build It! home page, and then watch the 2-1/2 minute video there, and follow whichever links interest you. The 30-minute video tour is a must -- it will really clarify everything for you. The video tour starts out mostly motivational in tone (i.e. benefits of working from home), but later on it dives into the details of how the tools and monetization strategies work, using real web sites as examples. I think you'll find it educational even if you have only a minor interest in making money online. Take a peek at some of the success story videos submitted by their customers as well as their in-depth case studies. If you have any questions about Site Build It!, you can submit them via the questions form, and you'll get an answer from a real Site Build It! owner/user. Take your time and explore all the information. I visited these links many times before I finally decided to build a website. Once you've completed your due diligence and you're ready to go here's the link that can change your life.